Carolyn Fish was still living in a tent along the bank of the Penobscot River during the first November snowfall of 2017. When a trio of Bangor police officers stopped by her campsite to ask if she needed help finding a place inside for the winter, she greeted them by name. 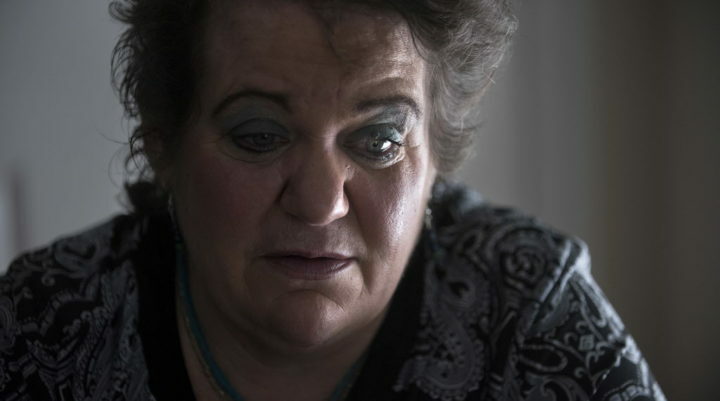 In the roughly four years since the fallout from an abusive relationship left her without a job or home in Bangor, Fish had developed a familiar rapport with the various police and homeless outreach workers she’d met as she cycled through apartments, shelters, campsites, motel rooms and, a few times, jail. Even though many of these same people repeatedly tried to help her find housing, she returned to living outside. Homeless year after year, Fish was the kind of client that shelter workers in Bangor described as the most difficult to help. “This is our home,” said Carolyn Fish about the tent where she and her partner, Larry Noyes, lived along the Penobscot River in Bangor last year. She is pictured Nov. 13, 2017. “I hated living in the woods,” Fish, 54, said in a recent interview. But an addiction to alcohol, among other setbacks, made it difficult for her and her wheelchair-bound boyfriend, Larry Noyes, to find an apartment and keep it without being evicted. Only a small percentage of people who are homeless in Maine go without a roof over their heads for months and months, as Fish did. But the small number of people who are homeless for prolonged periods means it’s possible for social service workers to know where they are and focus their attention on them. This is what has been happening in Maine, showing what is possible when the right people decide to collectively tackle a problem that had previously seemed insurmountable. Historically, homeless shelters were designed to meet the needs of those experiencing a temporary emergency resulting from circumstances of poverty. In the last five years, Maine officials have changed their approach to better serve people like Fish, who require a deeper intervention. As a result, since 2013, the number of adults tallied by shelters as spending more than half the year outside has shrunk from 262 to 68, as of July. While the changes stemmed from a desire to better serve people, officials like Ryan also realized how this small group absorbed an outsize portion of the already limited resources devoted to assisting Maine’s homeless. Likewise, studies have shown it costs Maine taxpayers more to help those who are homeless than to pay for their housing and social services. It remains to be seen whether Maine’s new strategy will end long-term homelessness. The already ambitious effort will be even harder to achieve amid a statewide affordable housing crunch, and given limited state and federal funding for rental assistance programs, experts said. 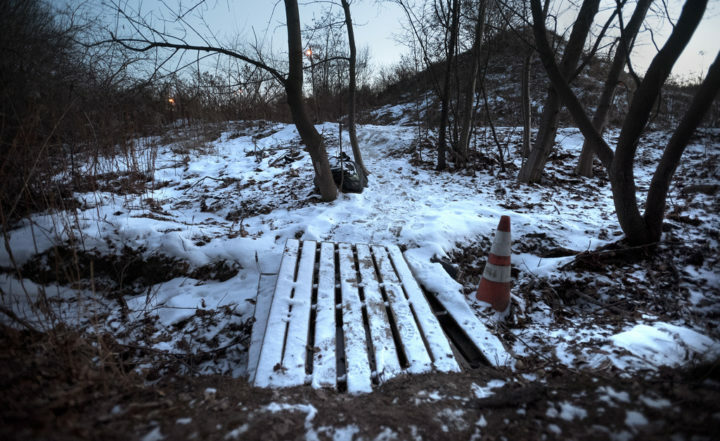 But for Fish, the new approach — which prioritized people like her who seemed to be perpetually homeless — was essential to breaking the cycle of vagrancy. When she and Noyes arrived at the Bangor Area Homeless Shelter a year ago, on Feb. 2, 2018, there was not only a bed, but a plan waiting for her. Growing up poor in St. Petersburg, Florida, taught Fish how to fend for herself at an early age. Scrappy and charismatic, she worked for 17 years at Governor’s Restaurant and Bakery in Bangor as a cook and waitress. Her life fell apart about five years ago when her abusive boyfriend imperiled her job and housing. Police frequently showed up at her apartment because of their fighting, and Fish’s boss warned that she could lose her job if he didn’t stop showing up at the restaurant. Every time she broke up with him, he won her back. “He ruined my life,” said Fish, who has a scar from the time he threw a malt liquor bottle at her face. By the time they split up for good about four years ago, Fish had lost her job, was unable to find permanent housing and started drinking heavily. She came to rely on people caught in the same cycle, many of them also struggling with substance use, mental health issues and the law. “I had friends everywhere. I could take a bath, take a shower,” she said. “But they were drinkers, that same addiction we had,” Fish said. One of them was Noyes. From the time they started dating three years ago, Fish and Noyes were inseparable, in part because Noyes required hourly care for the health problems caused by his drinking. He was the first man she dated who did not physically abuse her, she said, although she knew he had an extensive criminal history that included convictions for domestic violence. He was also one of two suspects in the unsolved disappearance of his wife more than two decades ago, in 1993, though he was never charged. Noyes denied any involvement in his wife going missing, to the police and to Fish, who said she was never afraid of him. Rather, she feared that he would die if she didn’t stay by his side. She helped feed and dress him when his motor functions began to deteriorate. Using a Sharpie pen, she wrote “Take me to the shelter or the hospital” on the back of his blue backpack in case they ever became separated. Even so, they slept outside in the warm months, mostly at a secluded campsite behind the horse racing track in Bass Park. Fish built a wooden wheelchair ramp over a grassy culvert along the path leading to their tent. The bridge Carolyn Fish built out of pallets, so she could get her wheelchair-bound boyfriend, Larry Noyes, over the washout, is pictured Dec. 12. For a while they lived in a wooded area near Bass Park in Bangor. In the winter of 2017, Noyes’ health worsened, and Fish stayed by his bedside for 170 days when he was hospitalized for an alcohol-induced stroke, she said. When he was released, he continued to drink despite a diagnosis of advanced liver cirrhosis, Fish said. Fish did not want to go back to Bass Park, which was too far from city services if Noyes needed an ambulance. 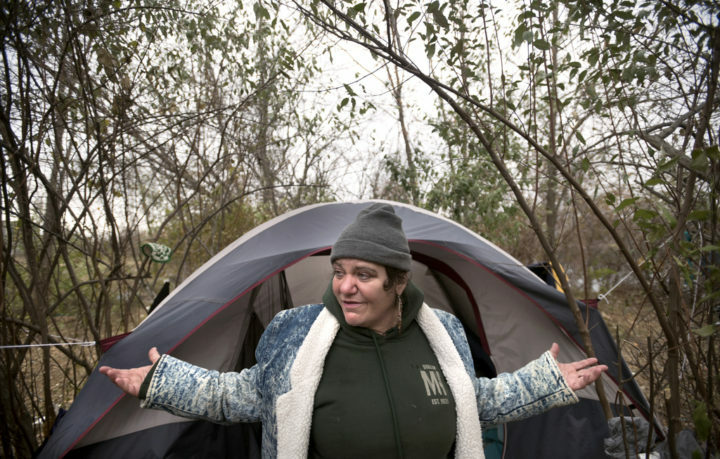 Instead, she and Noyes joined a sprawling encampment on the bank of the Penobscot River, or so-called “Tent City,” where they stayed until police broke it up around Thanksgiving. One night, not long after the police paid them a visit, Noyes became violently ill. He stayed in the hospital for 10 days with double pneumonia and sepsis from an infected leg wound. “That was the end of it,” she said. After years of choosing to live outside, she told Noyes she wanted to check into the Bangor Area Homeless Shelter. They did so on Dec. 11, 2017. It was a breaking point for Fish, but, for the shelter staff, it was more of a breakthrough. For years, they had worked to build trust with Fish and Noyes in anticipation of the moment they would be ready to accept help. “We were recruiting them hard,” said Boyd Kronholm, the shelter’s director. “Part of [homeless outreach] is meeting the person where they’re at. And sometimes they’re not ready to change.” That could be due to addiction, mental illness or having had a negative experience with social workers in the past. In Bangor, police officers do the bulk of the outreach, but they frequently arrest the same people they are trying to help — a dynamic that doesn’t help build trust. At first, Fish and Noyes were resistant to living at the shelter where they had to abide by rules they found tedious, Fish said. They left after only three days, on Dec. 13, 2017. They cashed some of Noyes’ Social Security checks, and spent the money on alcohol and motel rooms until February, she said. It was the dead of winter when they ran out of money, and Fish knew they couldn’t keep living day to day. Noyes’ eyes had turned a sickly yellow from drinking. They checked back into the shelter on Feb. 2, 2018, and didn’t leave until they had signed a lease on an apartment, 118 days later. 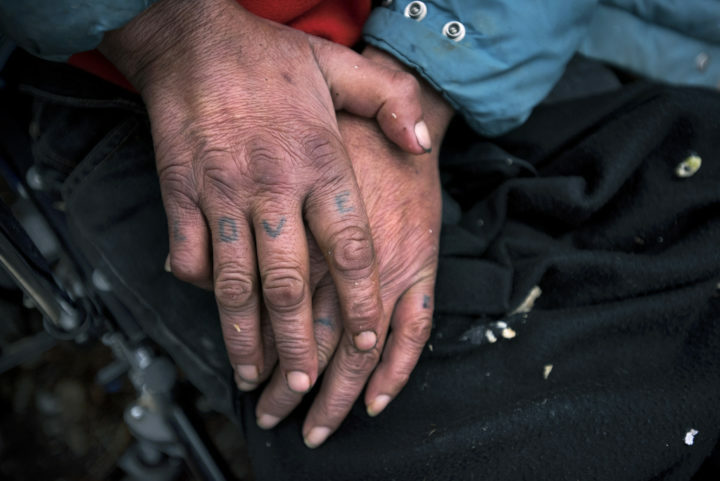 Larry Noyes’ hands are pictured when he and his partner, Carolyn Fish, lived in the homeless encampment along the Penobscot River in Bangor in November 2017. Local service providers see the same small group of people, those like Fish and Noyes, over and over again. But even though there aren’t many people who are homeless long-term — they accounted for 1.3 percent of the 6,450 people at shelters last year — they often stay at the shelters for a disproportionately long time. The pattern, policy experts realized several years ago, illuminated a weak spot in Maine’s homeless services that was both inefficient and costly. For instance, 116 of the 2,050 people who stayed at the 130-bed Oxford Street Shelter in Portland in 2013 were there for more than half the year, staying night after night because of a debilitating condition, according to Community Housing of Maine, the state’s largest housing provider for the formerly homeless. That meant just 6 percent of the shelter’s yearly clientele were taking up most of its beds, forcing staff to roll out overflow cots or turn others away. Meanwhile, 54 percent of the people who passed through the shelter stayed fewer than two weeks and 33 percent for fewer than three days. In addition to taking up shelter beds, people experiencing long-term homelessness regularly rely on other emergency services. It’s expensive. In 2007, a study in Portland found that it’s cheaper by nearly $950 in the first year to pay for someone’s rent and supportive living services — such as a case manager, mental health care and substance use treatment — than to cover the costs of being homeless. That’s because, when the study participants found housing, they needed 60 percent fewer ambulance rides, required 52 percent fewer emergency room visits, had 68 percent fewer interactions with police and spent 62 percent fewer days in jail. Plus, shelter usage plummeted 98 percent. Not surprisingly, getting people off the streets and into housing also improved their physical and emotional well-being. These findings align with a national trend toward a “Housing First” model to address chronic homelessness. Housing First programs prioritize the placement of people into housing before meeting their other needs. Housing alone removes the stressful conditions that exacerbate the symptoms of their crisis, said Ryan, who is also the executive director of Community Housing of Maine. This model convinced people like Ryan that it made sense to shift Maine’s resources toward finding permanent, supportive housing for the state’s most challenging homeless population. In theory, this approach to helping the minority would free up room for more people at shelters and save taxpayer money. In July 2013, when Ryan and other homeless policy leaders sorted through the state’s shelter data to determine who was staying in shelters or outside for more than half the year — a group they call “long-term stayers” — the list was only 262 people long. Beginning in 2013 at the direction of the Statewide Homeless Council, state and local homeless services providers have pinpointed specific long-term stayers and then prioritized them for outreach and housing. Most of these people were easy to find. In Bangor, a group of emergency service providers, shelter staff and the Penobscot County Jail social worker meet monthly to go over a confidential list containing the names of people cycling through the area’s emergency services. Carolyn Fish, 54, is pictured Nov. 26. In 2015, another major change occurred: MaineHousing, the quasi-state agency that administers state and federal dollars to Maine’s 38 publicly funded homeless shelters, changed its funding formula to one that rewards shelters based on how well they place people into housing. 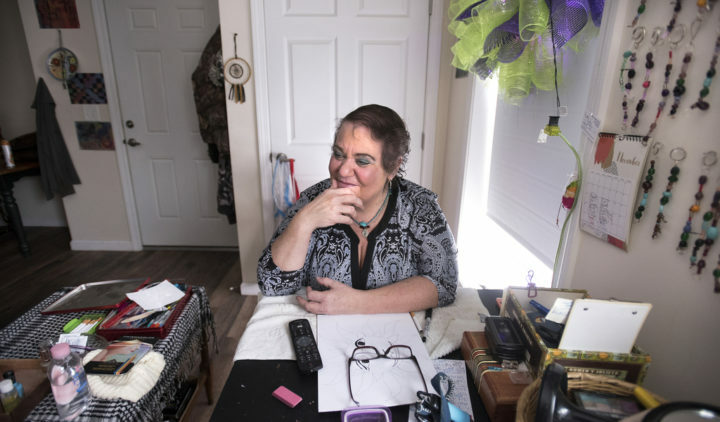 Part of that change shifted money away from the number of beds in a facility and toward funding housing navigators, who help clients with the daunting, bureaucratic process of applying for rental vouchers and maneuvering the housing market. They also work with clients after they’ve moved in to make sure they’re getting the services they need to avoid becoming homeless again. Nick St. Louis has worked on and off at the Bangor Area Homeless Shelter since 2011. In 2016, he was hired as the shelter’s first navigator. 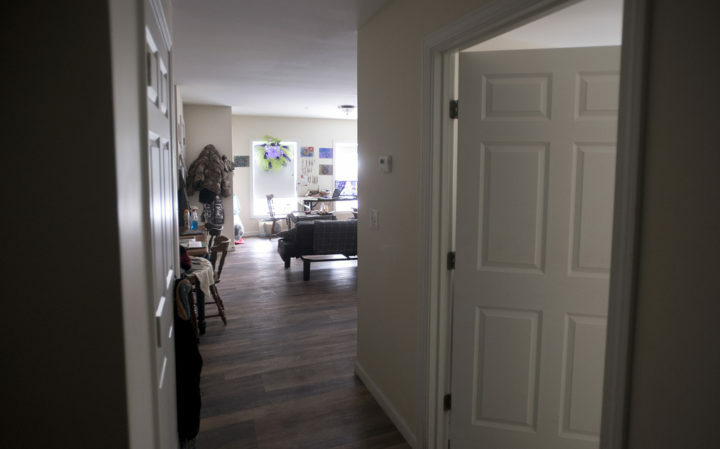 He’s known Fish for seven years, and when she and Noyes arrived at the shelter last December he fought to reserve them a place in a new affordable housing apartment complex that was under construction on Court Street, to be operated by Community Housing of Maine. Eligible tenants are required to continue using services provided by the shelter. Fish and Noyes needed to wait until construction wrapped up in June. The waiting was a struggle for Noyes, Fish said. He didn’t like the rules of shelter life — waking up at 6 a.m., having to put on shoes to go to the bathroom. But they managed. St. Louis would take them to visit the construction site every few weeks, “just to say, we are getting a place, Larry,” Fish said. In the meantime neither of them were drinking, and Noyes started seeing a doctor and eating healthier food. His health improved so dramatically he was able to walk using a cane. After five months in the shelter, they moved into their new apartment on June 1. Carolyn Fish moved into an apartment in Bangor in June, after she was homeless off and on for about eight years. “Nick worked so hard to get us in here,” Fish said, sitting in her living room, a short distance from the Kenduskeag Stream. Even though it was summertime when they moved in, neither she nor Noyes wanted to spend time outside, she said. But Noyes started drinking as soon as he left the shelter, despite warnings from the doctor that his liver would fail, Fish said. His relapse felt inevitable, she said, especially when people from their life on the streets kept stopping by the apartment, asking for a place to stay. It was hard to tell them no because so many of them had taken her in when she was homeless, said Fish, who was drinking again, too. Within two months, the couple had violated their lease four times because of loud parties and unsanitary living conditions, Fish said. By July, the shade of Noyes’ light brown eyes had returned to yellow. Carolyn Fish and Larry Noyes' Bangor apartment. “Getting people into housing isn’t the end of it,” St. Louis said. In many ways, helping Noyes and Fish find an apartment was only the first, and perhaps easiest, step to keeping them out of homelessness. That’s because the root causes that trigger a person’s homelessness still remain when they have a home. For Noyes, that was alcoholism. One night in late July, his liver failed, and he vomited blood. He died in the hospital the next day, on July 25, Fish said. He was 51. He’d had a home for two months. Noyes’ death reflects the extreme challenges social services providers face as they seek to reduce the number of Mainers who are homeless for prolonged periods. But despite those difficulties the Statewide Homeless Council Long Term Stayer Initiative has shown promising results, with a 76 percent drop in long-term stayers since 2013. The decline likely would have happened faster if Maine had more affordable housing options and a greater number of rental subsidies, Ryan said. “It’s hard to provide services to people that don’t want them. But it’s also hard to provide services that aren’t available,” St. Louis said. Experts were also quick to say that this achievement reflects the state’s ability to help people in crisis, not curb the rate of homelessness in Maine. While the reduction of long-term stayers has freed up more beds in Maine shelters, they are still perpetually full. “Society is creating more homeless than housing. It’s kind of a losing battle sometimes,” Kronholm said. In the meantime, Fish is tracking her progress day by day. This fall, St. Louis helped her enroll in a new program offered by the Hope House, which provided her with a case manager. Fish said she still struggles with alcohol, but is seeing a doctor and a grief counselor. She credited St. Louis with keeping a close watch on her. “He doesn’t want to see me fail,” she said. Carolyn Fish’s partner Larry Noyes died shortly after they moved into an apartment in Bangor this summer. Fish keeps his ashes on a table surrounded by items that he liked or have sentimental meaning. Her home is decorated with the key chains and drawings she spends hours making. It is tidier with Noyes gone, but she feels his absence every day. 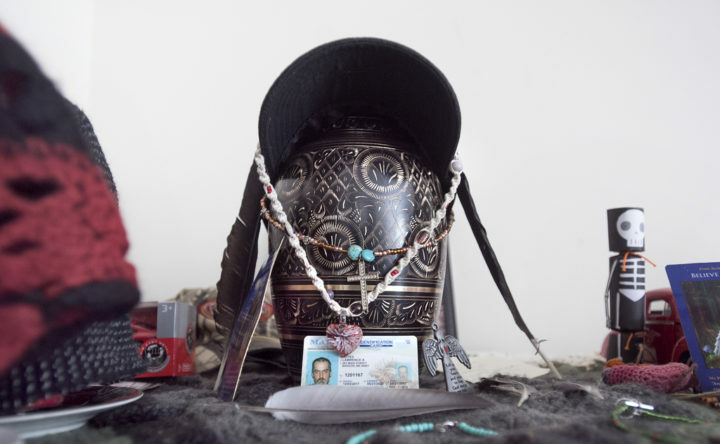 An urn containing his ashes sits on a table by the kitchen, and Fish has placed little mementos to him around it — his old driver’s license, a pouch containing trimmings from his beard, a pack of Winston cigarettes. Toward the final days of his life, Noyes was ornery and hopeless, and Fish felt trapped by his illness, she said. But since he died, Fish mostly remembers how funny he was and how carefree he could make her feel, even living in a tent. The last time she saw his face was at the funeral home, before he was cremated. She said he looked more peaceful in death than he had in a long time.